Rupert Leighton is a young genius. The U.K. born musician had already released his debut album Beyond Reflection by 18. In May 2006 he released his second album Take The Sidewalk. "I think the new album is definitely more mature and structured. I've learnt a lot over the past year which I've been able to put into this CD, both musically and production wise," comments Rupert. Influenced by musicians as St. Germain, Herbie Hancock, Prince and Sting Rupert creates a modern style at the boundary line of smooth jazz and chill out music. The title of the starting track Amuse-Bouche was taken from the world of haut cuisine. Rupert combines the ease of contemporary music with the finesse of jazz. In this packet also appears Graham Hutton on flugelhorn. But mostly fascinates the brilliance of Rupert's jazzy piano play. Amuse-Bouche is not only entrance but certainly highlight of this astonishing album. My Sahara demonstrates that Rupert is a never-failing fountain of new musical ideas. Speediness and melody find a new home in his creation. His eagerness to experiment is refreshing and makes his style vivid. With the melodious Take The Sidewalk we dive deeper into Rupert's ocean of electronic sounds. Although structured the title track offers much surprise attacks. Vanity is a dance floor creation with flute and reverb effects on synth sound. City Heat reminds me at the style of Soul Ballet. A very appealing piano melody line. But Rupert's devilish mood is ready to get up to all sorts of pranks. From 3:00 starts the curious bridge after the smooth line. The up-tempo Calahorra Dance mixes furious piano rides with various rhythm samples. We listen to Graham Hutton in a short intermezzo. Don't await much Jazz in Jazz Chat. Anyway Rupert's performance is easy and impressible. oombalaQuako is Rupert's unique word creation and danceable excursion in the world of wavetones. Pure joy of jazz is to hear in Drift Along. Starting as solo piano, upright bass and drums are joining to a dense club jazz. Solstice Illusion is featuring Nigel Ellis (soprano sax) . Nigel Ellis plays the saxes, clarinets and the flute and has performed with many orchestras including the London Symphony Orchestra, The Royal Philharmonic Orchestra and The Royal Liverpool Philharmonic Orchestra. He is also member of the group Suspiciously Elvis. This tune has a vibrant retro feeling with its synth bass and the Rhodes Piano sound. 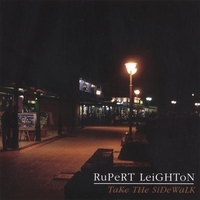 The final tune We Need To Talk presents Rupert Leighton's vocal talent. Bluesy vocals and incredible synth gimmicks make this tune to a worthy keepsake. Rupert Leighton's sophomore project opens new perspectives in contemporary jazz. Intelligent arrangements and consistent conversion of ideas, talent and acquired mastership make this album to something special in the music world.